Within the last several years this is the first time I am missing the Book Fair in Dhaka… and I am really missing that fair. To be frankly, this is the only fair that allured me. The fascinating well gournished book stalls, the smell of newly publish books, exploring the fair with friends and family… all of those I am terribly missing. And today is February 21… The International Mother Language Day. A memorable day in the history of Bangladesh. 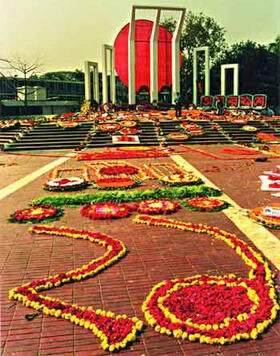 It is the 57th anniversary of “Ekushey February” this year. Within this span of time has acquire its own place in online. The number of Bangladeshi bloggers as well as Bangla blogs are increasing day by day. People are now writing their blogs in Bangla. All of these happen because of sacrifices of some great people in 1952. My gratitude to those who sacrificed their lives for establishing Bangla Language on 1952 and to the all languages of this world. Each language is like a soul which has its own fascinating beauty. Everything can change, but not the language that we carry inside us, like a world more exclusive and final than one’s mother’s womb. Today I went to Bangla Academy Boimela. For the last two weeks I just sorted out a list of books that has to be bought from the fair. As usual my sister helped me in that case. I felt the same emotion that I felt every year in boimela when I entered the entrance gate. All the publishing houses were colored with colorful covers of new as well as old books. It was just like a festival, a festival of books. All the renowned publishing houses were crowded with people as they publishes most of the books written by popular writers. I am one of the fan of Muhammad Zafar Iqbal. And as usual I bought his latest sci-fi and teen-adventure books. I’ve been searching for some old but appealing books that I’ve searched in many places. This time in Bishwashahittya Kendro, I got three of them. These are “Jokey’r Dhon” by Hemendra, “Chadey’r Pahaar” by Bivutybhushon and a story collection of Porshuram. Unlike other years, Dipu was not with me this year in Boi Mela. Last several years, we just spent hours after hours in Boimela by just comparing the books. Dipu has a good taste in transliterated books. Some times we just bought books by seeing it’s front and rear cover. If we didn’t like the book then we just blaming the author for such a book 🙂 ! I was disappointed by the UNMAD stall. UNMAD is a cartoon magazine like MAD. Every year they brought some really hilarious funny posters and stickers which were sold like hot cakes. But today I didn’t find anything like that in their stall except some copies of their magazine issues. 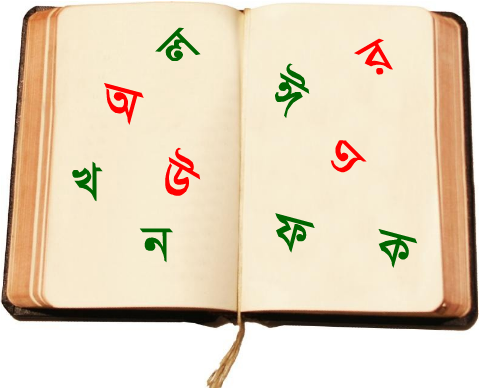 Another February has come which announces the glorious history of our beloved mother tongue Bangla. Who can live without speaking in his mother language? Nobody. And we are the only nation who sacrificed to gain the right of speaking in Bangla. Rafiq, Salam, Jabbar, Barkat, Shafiur and many unknown sacrificed their lives on 21 February in 1952 as the law enforcers fired on processions demanding recognition of Bangla as one of the state languages. In 1997, the UN declared February 21 as the International Mother Language Day. Click here to know more about 21st February and Bangla Language. Another magnificent event of this month is the book fair which is widely known as “Omor Ekushey Boimela”. Bangla Academy has been organizing this book fair since 1972. For the whole February, this fair will be the common place for the writers and readers. Releasing new books and seminars on Bangla language is the common everyday event in the fair. Besides the seminars where keynote papers are presented and the Bangla Academy awards are distributed, the academy also organizes cultural programs and discussions every afternoon during the fair. The programs include musical and dance performances along with other forms of stage shows. But the main attraction is still the books, the fresh new books. I always await for this book fair. Though I can buy book from nearby book shops, but I await the whole year for buying books from this fair. You can’t describe the fair scenario, it’s just great. People are crowded in the stalls, seeking favorite books, writers are busy with giving autographs on their newly released books, books are every where, the air is smelled with the scent of newly printed books. Last several years, in book fair, my closest friend Dipu was with me every time. But this time he is away from Bangladesh. Don’t know how I’ll enjoy book fair this time without him! Hope like every year people will gather in book fair to celebrate the glorious 21st February. Proud to speak in Bangla.